Pin It There are a lot of good things to say about chickpeas. They are a good source of protein, very low in fat, very filling, and in my opinion, very tasty too. Oh, and did I mention versatility? 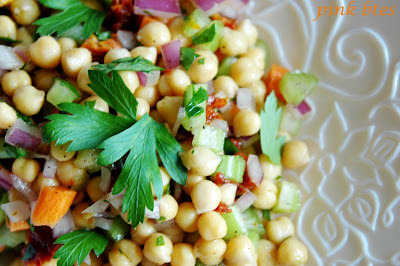 Chickpeas can be used in soups, salads, as side dishes, or as a snack. And it's pretty inexpensive too. So with all that going for them, why aren't these beans more popular? My guess is that most people just never see chickpeas on the menu except at Indian restaurants. And while I love a good Chola Masala, I think it is a shame that garbanzo beans don't get more exposure in the restaurant scene. So I am doing my part to promote these wonderful food! 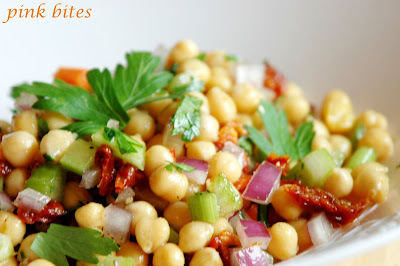 As usual here at Pink Bites, this is an easy dish, healthy and it is a perfect meal for one. Carrots and celery give this salad a nice crunch, while the sun-dried tomatoes bring a punch of unexpected flavour. Make a salad dressing with 1 part lemon juice or vinegar, 2 parts olive oil (I mix a little bit of the sun-dried tomato oil), salt and pepper. Mix all ingredients and the dressing, I like to put them in a Tupperware, close the lid and shake it. Top it with Parmesan shavings and freshly ground pepper. Lovely salad!!! I'm a huge fan of chickpeas. 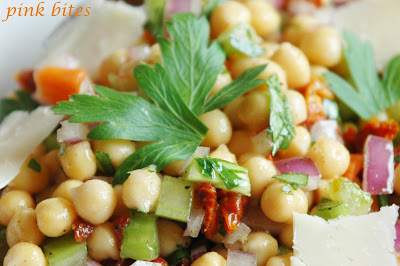 I really like the sound of this crunchy chickpea salad. Veggiegirl - welcome to the chickpea fanclub!! Holler - I had the same problem, so I solved it by having a container in the fridge pretty much at all times, just for snacking. Kevin - this salad is really crunchy, you'll love it. Loving this recipe! 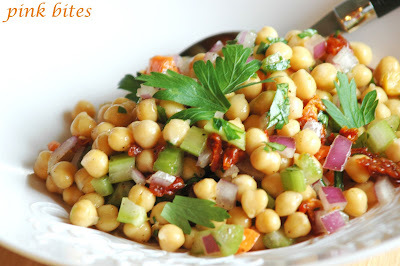 I adore chickpeas! I did this salad and it is really very, very good!!! !